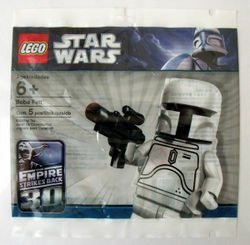 4597068 Boba Fett is a Star Wars promotional minifigure that had a variety of limited releases in 2010 and 2011. White Boba Fett is a standard Boba Fett minifigure, moulded primarily in white instead of the usual colours (its head and blaster are black) and featuring minimalist printing. The set was available in Sweden with purchase of 8097 Slave I, in Canada at a major toy fair, in America to builders of the giant LEGO mural at Star Wars Celebration V, and in the United Kingdom and Ireland with purchase in Smyths toy stores. Facts about "4597068 Boba Fett"
This page was last edited on 9 January 2016, at 18:28.